So you have decided to travel to the exotic land of India. Unfortunately this is no small task and it is recommended that you plan a trip like this out more thoroughly than other destinations. Lonely Planet Guide Book: Since India is such a large diverse country with a chaotic tourist industry, it is highly recommended that you bring this guide with you if your whole trip is not planned out. The Lonely Planet India book is better than others that I have seen. Toilet Paper: Most places in India only have squatter toilets without toilet paper. Considering diarrhea is high among travelers to India, this is highly recommended to be brought along at all times unless you don't mind using water and a bucket. Pepto Bismol: Speaking of diarrhea, this is or some form of other stomach medicine is a must. Chain & Lock: If you plan on taking extended train trips in anything lower than 2nd class compartments, this is a must have item to make sure your luggage does not wander off. Mosquito Repellent: Mosquitoes are overly abundant during the warmer times and can be really annoying. A Buddy: Most hotel rooms in India are doubles and charge you the same rate alone or with some else. A large part of traveling through India is done by taxi which also charges the same amount regardless of who comes with. If budget is a constraint, it is recommended to travel with someone. Short stretches are traveled by train, bus, or taxi while longer stretches should be traveled by plane and train. Plane tickets are often priced about the same if not lower than train tickets. Everything in India should be booked at least 2 weeks in advance, so be sure to plan ahead! If you are planning on going to India during the summer you are limiting yourself to the Buddhist northern part since most of India is unbearably hot. However, some passes in the Himalayas open up that are not accessible during the winter. 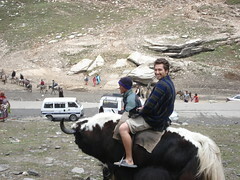 Going any other time of the year you have the option to explore most of the Indian sub continent. However be aware to make advance bookings, as tourism demand is higher then the supply can keep up with. Next: Experiencing Dharamsala – also known as little Lhasa, the Indian home of His Holiness the Dalai Llama and other Tibetan refugees. I believe the best time to travel India is around early October or around Christmas when festivity season is at its peak. Luxury train travel to places like Agra, Jaipur, Gwalior etc. is also rapidly gaining momentum when it comes to international tourists.